In late 2012, Scheffey joined forces with the Kahn Lucas Outlet team to raise the visibility of their brand, Youngland, in south central Pennsylvania at two outlet locations. The goal was to grow brand awareness, in turn increasing store visitation and sales. With an already inspiring and relatable message crafted over the course of 123 years of success to help girls “dress beautifully and live beautifully” in age-appropriate ways, Scheffey immersed itself into the brand with research to better understand what resounded positively and negatively with its customers, who its consumers were, and what strengths and weaknesses existed. Serving as an extension of the New York-based corporate team for Kahn Lucas, it was important that Scheffey balanced the existing brand with eye-catching, intriguing campaigns that were results driven to guide future efforts. 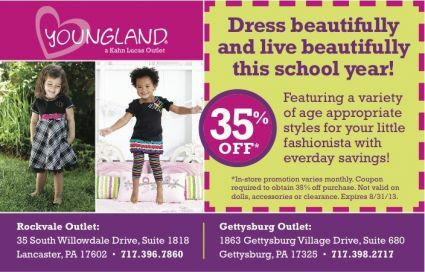 Below are two sample advertisements, featuring a traditional print ad and an e-marketing banner ad, from the Youngland Back to School Campaign, which had a strong redemption rate. Two short months after the launch of the Back to School Campaign, Kahn Lucas opened a temporary holiday storefront at the Park City Mall. The new location helps to kick-off fourth quarter and holiday marketing.